My friend Bryan Wu sent me this Wired article about Patrick Blanc‘s enormous vertical gardens. The one pictured above is on the exterior of London’s Athenaeum hotel. It is eight stories tall, with 260 plant species and 12,000 plants. What’s remarkable is that Blanc is a botanist who carefully selects plant species for climate, wind, and sun versus shade. He has worked with Herzog & de Mueron on the CaixaForum in Madrid, and installed a huge indoor wall at the Taipei concert hall. Below is his largest wall, 15,000 square feet, on the Rue d’Alsace in Paris. Over this past weekend, the Tokyo Green Space blog surpassed 10,000 page views. Begun in August of 2008, blog traffic has been exponential in the past months, with this current month reaching 3,500 views. 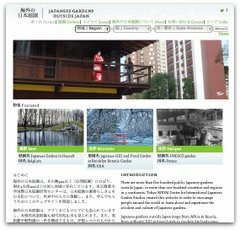 It is a great pleasure that the blog’s themes– the remarkable green spaces of Tokyo and the value of urban ecology– have resonated so widely. The international audience includes ordinary gardeners, researchers, professors, students, urban planners, landscape designers, environmentalists, government and corporate leaders. Today is Japan’s national elections, with the opposition Democratic Party expected to take power in a landslide victory over the ruling Liberal Democratic Party, previously out of power only once since 1955. The electoral shift has been related to the nearly two decades economic decline and a desire for political change. Recently, the British owner of one of Tokyo’s most expensive plant shops explained to me how the current economic downturn is affecting sales at his store. Global banks, corporate headquarters, and office lobbies have suspended regular deliveries, forcing the plant shop to layoff employees and reduce salaries. In this difficult economy, the shop’s revenue has become more heavily dependent on government and the yakuza. In anticipation of today’s election, a US political advisor has ordered 480 of his most expensive white orchids, five stems for 50,000 yen ($535) each, for each winner of the lower house of the Diet. That single order is worth $250,000. It is interesting how an election creates direct economic benefits, and the owner is sad that it does not happen more often. The other clients who have not cut back in spending are the yakuza. According to my source, the yakuza routinely order very expensive plants and flowers to send to their rivals. They also insist that delivery be made by the shop’s truck, even in Osaka and Kobe so that the prestige of the Tokyo shop is circulated publicly. I was taken aback at the idea of sending such lavish gifts to one’s rivals, but apparently the yakuza, like almost all other sectors of this consensus-oriented society, strive to maintain positive relationships with their enemies. Watching students study rice in a field lab reminded me that, yes, I am really affiliated with an agricultural university in Japan. Nodai is the Tokyo University of Agriculture. The students were counting the number of rice stalks and the number of grains in each specimen. I wonder if the variables involved the plant, the growing medium or environment. The students looked very serious. On my way to the Kyodo train station from Nodai, my Research Fellow colleague noticed a two-story bitter melon green curtain. We were impressed by how full it is, how tidy and well trained. There were a number of large bitter melons on the vines. Bitter melon is certainly hardy, and the whole large vegetable garden is growing out of two medium sized plastic tubs, and taking up minimal space in the car park area of someone’s home. On my way to a house-warming party last weekend, I passed this large and very full community vegetable garden in Shimo Takaido, near the Kami-Kitazawa station. I have not seen many of these in Tokyo, yet this large plot seems very popular and intensively planted. It would be great to get a tour of this community garden, and to find others. Satoyama (里山), a term I first heard from 5bai Midori, describes a Japanese eco-system that supports biodiversity and is paradoxically the result of human transformation of forests over 2,000 years of rice farming. A fascinating Japan Times article explains what satoyama is, and how it is threatened on the one hand by large-scale agribusiness and pesticides that are sterilizing the land, and on the other hand by the encroachment of forests on villages that farmers are abandoning in rural Japan. Satoyama are heavily managed forests and fields that replaced Japan’s densely shaded wilderness with a system of concentric rings of sato (village), satoyama (managed woodland), and okuyama (wild forest). In proximity to dwellings, cutting wood for fire provided openings in the forests that encouraged sun-tolerant trees and created habitat for wildflowers, butterflies, birds and other species that do not exist in wild forest. Cultivating rice paddies, and building the irrigation systems of reservoirs and canals that supply them, created aquatic and semi-aquatic habitat for amphibians, insects, water plants, crustaceans and fish. The system depends on the close proximity of all three rings, spread out over a large portion of Japan’s mountainous island habitat. According to Japan’s Environment Ministry, more than half of Japan’s threatened plant and animal species live in satoyama areas. The Environment Ministry has created at least three editions of a national biodiversity strategy and launched a Satoyama Initiative that has included knowledge sharing with Asian regional conferences. And Japan will next year host the 10th Conference of Parties of the Convention on Biological Diversity (COP10) in Nagoya. Resources in English include Takeuchi Kazuhiko et al’s book Satoyama: The Traditional Rural Landscape of Japan (Springer, 2002). And there’s a Japanese Environment Ministry video on satoyama on YouTube (no embedding unforuntately). Tokyo Green Space celebrates the ingenuity of people who create greenery in a city that is often poorly planned, dominated by concrete, and overly paved. However, it is worth pointing out the prevalence of dead spaces by design, often created by local governments and even Tokyo Metro. Above is a nearly brand new elevator providing access to the Shin Nakano Marunouchi station of Tokyo Metro. The elevator occupies an odd shaped and small space between a road and parking lot, and between a pachinko parlor, a large apartment building and a busy street. Next to the rectilinear elevator and covered entrance is a sizeable triangular area bordered by a brown colored metal fence. Clearly, the Metro does not want people to park their bikes in this small area, and is probably pleased that they have accomplished this goal. However, the fence has made this centrally located land a dead zone. So many other uses could be made with that space: a tree or two, a bench, a vegetable garden, a food cart, newspaper stand, a bulletin board for community events. Given the amount of local gardeners, I am certain that the Metro would not need to maintain the space with their own staff. A similar dead triangle zone was created between a pedestrian path and a small street. Again, the design goal is to prevent vehicles from entering the pedestrian path (in the foreground with white tiles on the ground). Here, too, the brown metal fence creates a triangle of deadness, where the yellow and green poles would have seemed adequate for the job. If the brown metal fence was not there, the space could also be used for much needed shade, a fruit tree, a community garden, or a bench. The creation of these dead spaces by government authorities suggests a lack of imagination and awareness. Finally, this space between houses and apartments is filled with concrete, and apparently unused. It is unclear whether the space is public street, individually owned or somehow shared space between neighbors. In any case, it is a wasted opportunity for greenery and community. Framing a second floor apartment entrance, this mature grape vine’s fruit are turning purple in mid August. I blogged earlier about the elderly woman who takes care of this garden. I have not seen her since she told me, “I like flowers, but I also like flower lovers.” She also mentioned how much she enjoyed my garden, too, although she has never been to our upper floor balcony. Her entire garden, which includes the amazing grape vine, a fig tree and some tall roses are growing out of five or six plastic buckets on the edge of the narrow street and a few hanging plants with blue flowers outside her entrance. The plants intrude a little on the street, but mostly the garden is vertical. On a small street that connects my apartment to the station, I have noticed these tall sunflowers suddenly appear. They are growing in the tiny public space between a residential concrete block wall and the narrow street. The sunflowers occupy less space than the red JP mail box they stand over. Juxtaposed with the traffic mirror and bed covers airing out in the sun, this burst of yellow screams summer. On a prominent corner of Gaien-nishi Douri in Aoyama is this six story mixed use building with a vertical rose garden called Aoyama Art Works. On one side is all extra tall glass windows and a ground floor Specialized bike shop. On one of the smaller trapazoidal sides, framing the entry way, is a wall of yellow roses with incredibly thick vines. On close examination, the metal trellis structure also supports additional planter pots on the higher floors. The effect, however, is of one giant rose bush. It must look spectacular in full bloom. This is an impressive example of how a gigantic garden can be created with less than half a meter of depth on the sidewalk. Braving the summer heat, I walked through the huge green space of Aoyama Cemetery in Minato. Despite the approach of the obon holiday, there were few people inside the park, including a solitary runner and a few cars passing through. The cicadas were incredibly loud, and large crows perched in the trees. Aoyama Cemetery is Tokyo’s largest (26,000 square meters), with hills, valleys, many trees, and a central lane with 200 cherry trees. The 100,000 graves include Hachiko, famous Japanese politicians and artists, as well as a foreigner section (gaijin bochi). The cemetery is incredibly central, and provides a mix of natural views and tombs juxtaposed with the sights of new skyscrapers on the periphery. There is an odd resonance between the tombs and the tall buildings in the distance.